STRATHFIELDSAYE bolstered its percentage by 16 per cent and catapulted to the top of the ladder following a merciless 141-point slaughter of Maryborough on Saturday. While Stephen Milne booted nine goals and Sam Mildren three their colleagues in defence at the other end of Flight Centre Park restricted the Magpies to a meagre two goals for the day. And those Maryborough majors were all scored before half-time. No one could have known what the outcome would be when the huddles assembled at the first change. Just 10 minutes into the game, Maryborough’s Emmett Smith landed the first goal of the day and even though Kris Lea, skipper Shannon Geary and Milne replied before quarter-time Strathfieldsaye led by just 13 points at the first break. The Storm did add six goals to one in the second term to race to a 45-point lead by the long break before the avalanche started in the second half. Milne had four goals to his name in the first half, although his third was a ripper as he soccered a shot home at the Tannery Lane end. Then the clever little goalsneak took centre stage. Two more in the third term, thanks to great passes from Jake ‘Stingray’ Hall and Harry Crone, took Milne’s total to six with a quarter to play. Hall, too, wasn’t to be discounted. He slotted two in the third term with his marking, especially off a vertical leap, outstanding. Maryborough captain Luke Bucknall and teenager Billy Mahony tried to lift their team but the Storm defence led by Jayden Donaldson, Matt Smith and Ash Trollop scarcely let the ball inside the Pies’ attacking 50. Donaldson also had a gallop in the front half and nailed a last quarter goal. After seeing off Coby Perry, Milne had Jayden Hooper as his opponent in the final term. Supporters had their Records and pens in hand as Milne first marked over Zac Egan to nail his seventh goal. Following lead-up work from Shannon Geary and Mildren a long shot from Milne squeaked over the outstretched hands of Magpie defenders. And then after playing on he got to nine with a snap from the goal square. However, with 25 minutes gone Milne marked inside 50 but his set shot slid wide to leave him anchored on nine goals. His final tally was 9.5. Storm coach Darryl Wilson paid tribute to his defenders, as well as his productive forwards. “Our back half has stood up extremely well over the past month and today I thought they were superb,” he said. 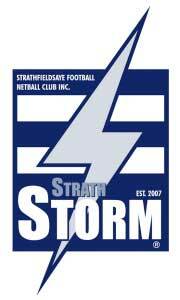 Goals – Storm: Stephen Milne 9, Sam Mildren 3, Jake Hall 3, Shannon Geary 2, Kris Lea 2, Shaun Everington, Daniel Geary, Sean Johns, Jayden Donaldson, Nathan Moffat. Maryborough: Emmett Smith, Luke Bucknall. Best – Storm: Stephen Milne (best on ground), Jake ‘Stingray’ Hall, Shannon Geary, Jayden Donaldson, Matt Smith, Matt Johnston, Michael Pilcher, Ash Trollop. Maryborough: Luke Bucknall, Billy Mahony, Nathan Bond, Tyson MacIlwain. With only four rounds to go, BFNL Top Five: Strathfieldsaye 13-1, 211.73 percent; Sandhurst 13-1, 205.25 %; Gisborne 11-3; Golden Square 8-6; Eaglehawk 7-7. This entry was posted in Footy and tagged Bendigo Football leage, Stephen Milne, Strathfieldsaye Football Club. Bookmark the permalink.